Supporters of Italy’s fractured centre-left opposition Democratic Party (PD) on Sunday (3 March) elected Nicola Zingaretti as new leader, an ex-communist son of a bank manager who will now take on the ruling populist coalition led by the far-right Lega. The PD was left reeling and languishing in the polls after the anti-establishment Five Star Movement (M5S) and the anti-immigrant Lega won elections and formed a government in June of last year. Zingaretti, who has been compared to Britain’s Labour chief Jeremy Corbyn and Senator Bernie Sanders in the US, tweeted his thanks after most of the primary votes were counted saying it was “now time to turn the page”. Around 7,000 polling stations, including 150 abroad, had been staffed by 35,000 volunteers throughout the day, with over 1.5 million turning out. The other candidates were Roberto Giachetti, 57, considered the closest to former PD leader and prime minister Matteo Renzi’s centrist politics, and Maurizio Martina, 40, a former agriculture minister. Zingaretti, 53, is currently the president of the Lazio region, which includes Rome, and is a former Italian Communist party member as well as a founding member of the PD in 2007. Born into a middle-class Roman family, he was a member of the European parliament and is a supporter of European federalism who has criticised austerity measures. His Jewish mother and grandmother escaped the Nazis in 1943, while his great-grandmother died at Auschwitz. His father was a bank manager who “never missed a day of work in 40 years,” he said in an interview last year. His older brother Luca is famous in Italy for playing the title role in popular detective series “Inspector Montalbano”. Lega leader and Interior Minister Matteo Salvini sarcastically wished Zingaretti success in his new job, while noting that turnout in PD primaries had been dropping. 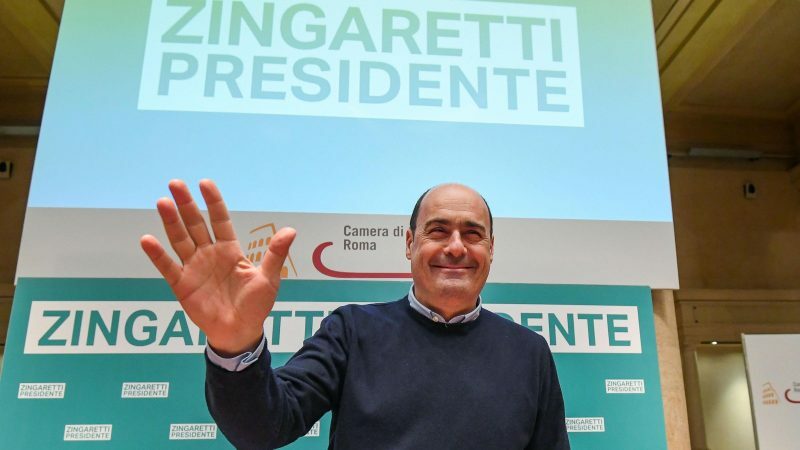 Zingaretti told journalists after his victory that “Salvini has created a model based on hatred and is betraying the productive north”, his political opponent’s political heartland. Salvini’s Lega and the M5S have seen Italy’s growth rate drop and deficit rise as they have sought to deploy expensive, populist measures against the wishes of Brussels and the markets. Zingaretti is considered an intellectual leader, who holds social media partly responsible for turning people away from helping the collective. “In the Colosseum 2,000 years ago the people were allowed to express judgement only with a thumbs up or down,” he said in an interview last year. While often disagreeing with former PD leader and prime minister Renzi, the two were never in open conflict. “Those who speak ill of others do so because they have nothing to say about themselves,” Zingaretti said. Zingaretti’s policies will become clearer after the PD holds its party conference on 17 March. All three candidates had already excluded a future alliance with the M5S, which won 220 seats in the lower house elections last year compared to the PD’s 112. The far-right Lega party won 123 seats but has overtaken the M5S in opinion polls since then thanks largely to Salvini’s tough anti-immigrant line. The left is nevertheless finding its feet again, bringing tens of thousands onto the streets of Milan on Saturday for an anti-racism demonstration. The Milan demonstration was a reply to those who have imposed a policy of “closure and exclusion” that has become intolerable, elder PD statesman Romano Prodi told La Repubblica newspaper. Renzi, who resigned after a failed referendum on constitutional reform in 2016 which Zingaretti backed, but remained PD leader until last year, voted in the primary in his hometown Florence. The man who in 2014 became Italy’s youngest-ever premier refused to publicly back a candidate, saying the “different movements that were with me over the years have divided themselves among all three candidates”. Renzi, 44, appealed against infighting, whatever the result.